This is a fun way to hunt if you like dogs. We start early, before daylight, to get to our destination. When we arrive we will collar the dogs, "clean them out" by running (roading) them up the road, then load them up on the dog box. 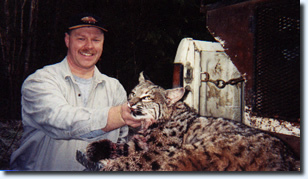 When they smell a bobcat they will "strike". We will turn them loose and listen to the exciting race that follows. When the cat is treed we will drive as close as possible on an available logging road, then approach the tree on foot. I always tell my hunters not to get in a hurry, we have all day to get there, the dogs will stay at the tree until we go in and get them out. I always tie my dogs back before giving the hunter the go ahead to shoot. My dogs are worth a lot of money so I do not want one getting shot accidentally. This hunt is in the brushy re-prod fir trees with some big timber. Most cats like to live in the brush. Sometimes we hunt in a little fresh snow but usually we stay below the snowline. This is a great hunt to bring a camera along on, there is beautiful scenery as well as other game to photograph. Featured in this video, "Hounds In Hot Pursuit"!